The history of TRIO is progressive. It began with Upward Bound, which emerged out of the Economic Opportunity Act of 1964 in response to the administration's War on Poverty. In 1965, Talent Search, the second outreach program, was created as part of the Higher Education Act. In 1968, Student Support Services, which was originally known as Special Services for Disadvantaged Students, was authorized by the Higher Education Amendments and became the third in a series of educational opportunity programs. By the late 1960's, the term "TRIO" was coined to describe these three federal programs. 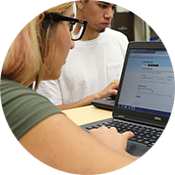 Student Support Services (SSS) is one of the six federal TRIO Programs funded through the United States Department of Education. Other TRIO Programs include Upward Bound, Educational Opportunity Centers, Ronald E. Macnair Post Baccalaureate Program and Talent Search. 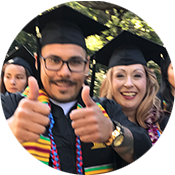 These programs are designed specially to assist low-income; first generation college students and/or students with a disability enroll in and successfully graduate from a post secondary educational institution. There are over 1200 TRIO programs throughout the country assisting college students just like you. Over the years, the TRIO Programs have been expanded and improved to provide a wider range of services and to reach more students who need assistance. The Higher Education Amendments of 1972 added the fourth program to the TRIiO group by authorizing the Educational Opportunity Centers. The 1976 Education Amendments authorized the Training Program for Federal TRiO Programs, initially known as the Training Program for Special Programs Staff and Leadership Personnel. Amendments in 1986 added the sixth program, the Ronald E. McNair Postbaccalaureate Achievement Program. Additionally, in 1990, the Department created the Upward Bound Math/Science program to address the need for specific instruction in the fields of math and science. The Upward Bound Math/Science program is administered under the same regulations as the regular Upward Bound program, but it must be applied for separately. The Higher Education Amendments of 1998 authorized the TRIO Dissemination Partnership program to encourage the replication of successful practices of TRIO programs. Finally, the Omnibus Consolidated Appropriations Act of 2001 amended the Student Support Services (SSS) program to permit the use of program funds for direct financial assistance (Grant Aid) for current SSS participants who are receiving Federal Pell Grants.